We had a “mastering” lesson on Circles recently. I wanted to share three quick stories. HJ wanted to talk about problem 23. 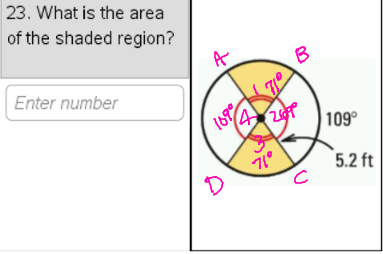 She was having a hard time describing a particular region about which she had a question, so she asked if we could label the points and angles. Of course! I have read and watched Dan Meyer talk about providing students an opportunity to recognize a need for labeling, a need for organizing by a coordinate grid, etc. 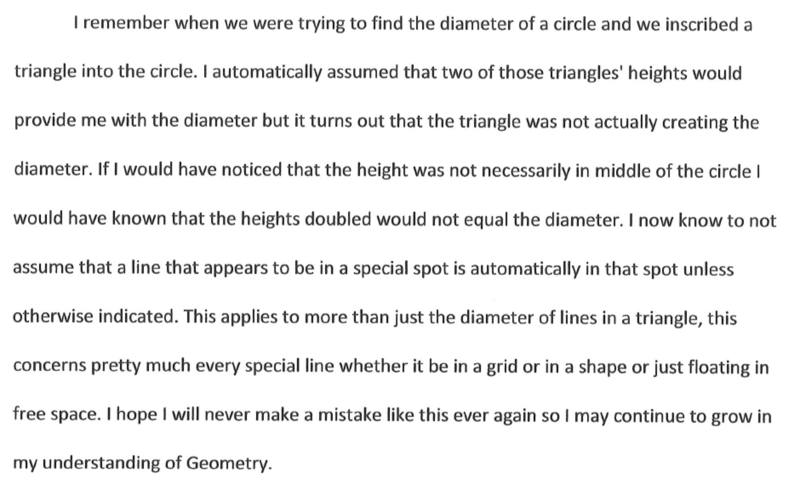 I cringe to think about how much time I used to spend in geometry on basic notation and labeling … valuable time that we could have spent doing more interesting tasks. What I’ve found is that the notation will follow when we model it in our everyday use. And when it’s not there, students might even ask for it! I was surprised by the student responses to number 20. 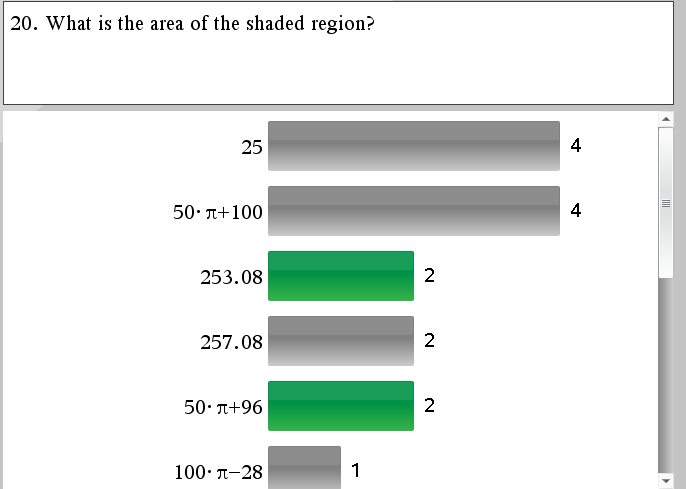 Not surprised that some students got it wrong, but what was is that so many students did to get 50π+100 instead of 50π+96? FJ talked us through a solution to get 50π+96, and the students agreed with his reasoning. 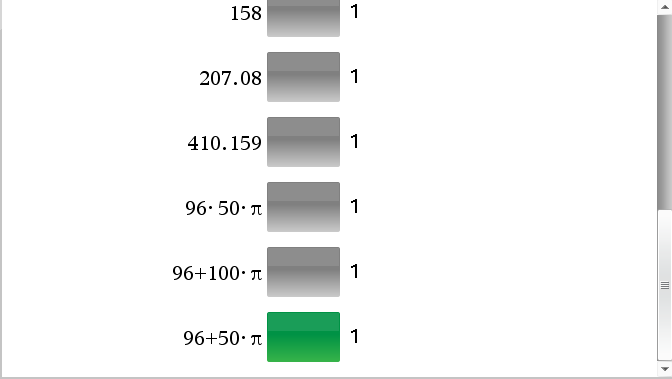 Will someone who got 50π+100 tell us what you did? 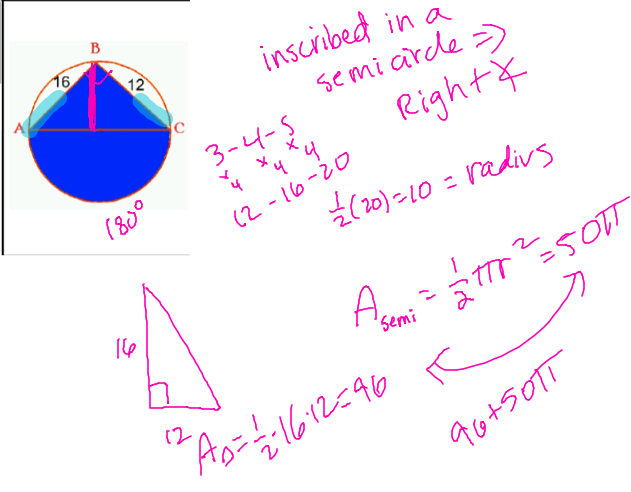 They had the same 12-16-20 right triangle as the others. 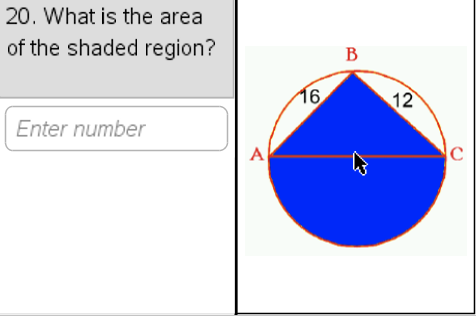 But instead of calculating the area using the two legs of the right triangle as the base and height, they calculated the area of the triangle using the hypotenuse as the base and drawing in the height. Incorrect assumption? The height coincides with a radius of the circle, and will be 10. RE wrote a reflection on this problem, which was a good opportunity to construct viable arguments and critique the reasoning of others. And #10. Three tennis balls are packaged in a pressurized can, one on top of the other. 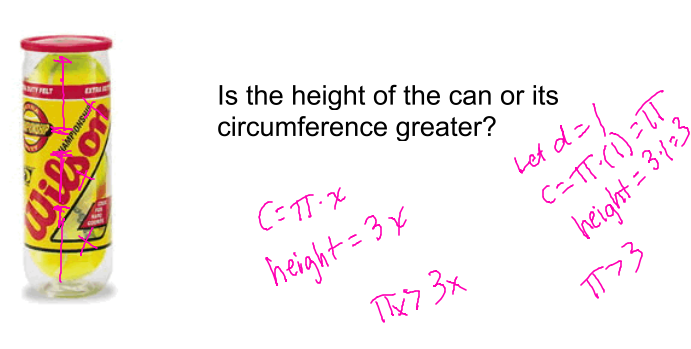 Is the height of the can or its circumference greater? Justify your answer. I’ve talked about this before…the importance of monitoring student responses before showing them to the class. 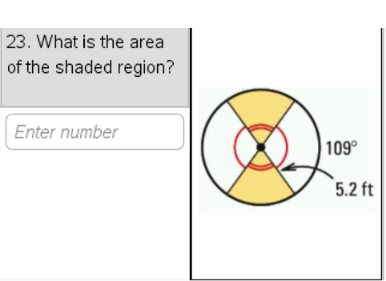 I deselected “show correct answer” before I displayed the results. And then I asked them to find someone at a different table who answered differently. Critique their reasoning as to why they chose what they chose. Do you agree or disagree? And I sent the poll again. And then HR shared her argument with the whole class before we moved to the next problem. I am convinced more every day of the value of my response system. The feedback helps me make decisions about what to do next. The feedback makes the Standards for Mathematical Practice a reality in my classroom. The feedback helps my students make decisions about what to do next. Am I leveling up to the learning goals for this unit? Or do I need some type of intervention before the summative assessment? I’m still reading Transformative Assessment in Action by James Popham.